During the school year (September through June), we offer a subset of our summer camp curriculum through enrichment classes. Our offerings include after-school programs; morning/lunch enrichment classes; home-school and weekend workshops. 1 – Public group enrichment classes that are to everyone who meets the age and pre-requisites. For 2018 Fall enrichment classes that are open to the public, click HERE. If you do not see any classes that your child is interested in, call (914) 218-8175 or email (westchester@computeradventures.com) to set up private group or individual lessons. 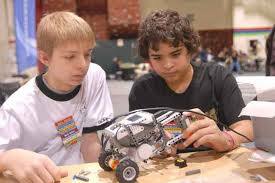 We will provide the instructors and all equipment (ie laptop, projector, robot sets, props, etc). 2 – Private group enrichment classes that are open to specific school or organizations. If any parents or program coordinator is interested in setting up our program at their school or organization, we can arrange to come to your location. We will provide all the equipment and props needed for our program. Click on Private Group Classes for more details. Our private group enrichment classes will come to your school or organization. We will provide all the equipment and props. All we need is one power outlet, and furniture for the students. Below is the list of schools and organizations that offer our enrichment classes. To register your children, please call the enrichment program coordinator at your school/organization. If you do not see your school, and would like to offer our program at your school/organization, please click HERE.